What’s the very first thing you need to do when you get ready to hire a designer for a website design or re-design project? A lot of people would say, Brainstorm potential designers or Approach web designers regarding their pricing and availability. But this is skipping one of the most important steps that will set you on your way to managing a strong web design project for your brand and business. The first step you should be taking as you prepare to hire a designer is to build out an organized plan for the project that you can share with them before you decide to work together. If you were a project manager for a large company, you would develop what’s called Request For Proposals, or RFP. This document pulls together all of the details about the project – requirements, deliverables, terms, contract details, and more – and makes them available to service providers who are invited to provide proposals on the project. You want to put together something similar, but much simpler and more informal. I call it a Project Information Package. A Project Information Package is a short document that identifies the key elements of the project, including scope, timelines, budget, and key objectives and requirements. You will share this document with any designers that you reach out to BEFORE they send you a proposal, so that they can prepare the best quote in response to your unique situation and needs. Your main goal is to identify your main goals, needs and expectations for this project, organize them, and communicate them clearly so that you and whichever designer you choose to move forward with are starting on a strong foundation. Here’s why this is so important. 1. It will help you to organize your own thoughts and get clear on what your expectations are. A lot goes into developing and launching a new website, and every project will look different. Making sure to develop a clear plan for your project before you reach out to potential designers will help you to be aware of exactly what you need, what the project will involve, and specific areas that you will want the designer to be aware of or provide support on. Creative entrepreneurs are often attracted to specific designers because of their aesthetic and visual design style. This is an important factor to consider when you’re choosing a designer for your web project, but it shouldn’t be the only one. Other major factors that will determine which designer is the right fit for you and your project include technical expertise (can they provide the functionality that your website will require? ), communication and project management style, budget, timelines, and the types of services they do (or don’t) offer as part of their packages. Having a clear sense of what your project entails – and what you will require from your designer – will help both you and the designer to assess whether the project is a good fit for both of you. It’s easy to think when you start, “Oh, it’s just a simple website”... only to realize that you forgot about a specific task that your website will need to perform that requires special coding or attention at a premium price. All of a sudden, your costs are higher than you anticipated, your stress is through the roof, and the project has become much more difficult for everyone involved. A strong Project Information package spells out exactly what you need included in your new website, so that the designer can accurately assess the scope of the project and price their quote accordingly, saving you money in the long run. Making sure that you and the designer are on the same page with regard to the project’s scope won’t just save you money – it’ll save you time, too. You’ll both be able to accurately plan for the amount of time that the project will take, and you’ll spend less time going back and forth on the details over the course of the project, because you’re aligned in terms of project expectations and requirements. This does not need to be fancy. It can be tempting, especially with design projects, to think that it needs to be visually exquisite or exhaustively detailed. This isn’t necessarily the case. Remember that your main goal here is to provide the designers you’re considering for this project with enough detail that you can both have a strong conversation about how the project will potentially look. You don’t need to have all of the details worked out. And it’s perfectly okay to have question marks or areas that you’re unsure of. But I guarantee you that, if you follow this process, you will have better conversations with designers about the nature of the project and how it will unfold than if you just send off a couple of emails and see what happens. So. That being said, here are the sections that you should include in your Project Information Package. And if you want a template that you can just download and fill out, I’ve got you covered. Tell the designer who you are and what you do – they need to get to know you! You may want to include your mission statement, if you have one, and a short description of your audience and how you serve them. In one or two paragraphs, identify what you need this project to do and how you expect the designer to help you. In addition to the website, do you need brand strategy? Logo design? Print and/or digital marketing collateral? E-commerce solutions? Identify any major project components here, so that they know what you’re looking for. But keep it high-level for now – you’ll provide more detail later in the document. Tell the designer what you expect this new website will accomplish for you and your business. If you’ve identified any other major components of the projects (for example, visual branding / logo design), talk about some of the strategy and objectives that are guiding those elements of the project. Bullet points for this section are totally okay! An important note: Deciding whether or not you want to state your budget in this document is a strategic decision that is totally up to you. Some people prefer to hold back on stating numbers so that they can see what the service provider comes up with; others just want to be upfront so that it’s clear from the beginning. I’ve personally done both in different situations. Designers will always want you to state your budget right away so that they can assess whether it aligns with their pricing structure, but whether or not you choose to include that information in this document or address it separately with each designer as the conversation gets started is your call. Are there any specific timelines or deadlines that you have in mind? This is especially important if there are hard deadlines that this project will have to meet. Additionally, if the project has multiple phases (for example, visual brand identity & web design) and you have specific ideas or expectations for when each of those phases will be completed, note that here. Here’s where you’ll identify the key details that will impact the project’s scope and ultimately the timeline and and cost. If you identified any additional project components over and above the website (e.g. visual branding, collateral, etc. ), provide some details here on what you need help with and what you expect the deliverables to be at the end of the project. “Website functionality” refers to specific things and capabilities within website that the designer will need to plan for. Basically, you should think through all of the things that your website needs to do and write them down here. For a restaurant owner, this might include a menu listing and a place for visitors to make reservations. For a coach, this might include the ability to book packages or consultations online, including payment processing. For a hand-letterer, this might include a shop where people can download digital products or order physical prints. Provide a list of all of the website pages that will need to be created, and be detailed! For example, don’t just say “Shop” – identify the number of product pages you’ll need, and that you’ll need a checkout page. Similarly, creating a new website from scratch or importing three years’ worth of old blog posts will impact how much time the designer spends on setting up the website. The more you can tell them, the better! Reading through this list, it may feel a little overwhelming. But remember – it doesn’t need to be fancy or perfect. The goal is to help you prepare for this project by pulling together the most important information and presenting it clearly to the designer so that they can give you the best information possible about how they would deliver on the project. Start by downloading the template and filling it out as you go. When you’re ready, send it out to the designers you’re considering for this project and ask them to get back to you with a proposal on how you could work together. Think of a Product Information Package not as a final document, but the framework for a discussion that you’ll be having with your designer as you move forward. It’s an opportunity for you to prepare the foundation for a successful project in an organized, considered way – and I guarantee that you’ll find it makes a huge difference in your experience of the rest of the project! There's a course for that. 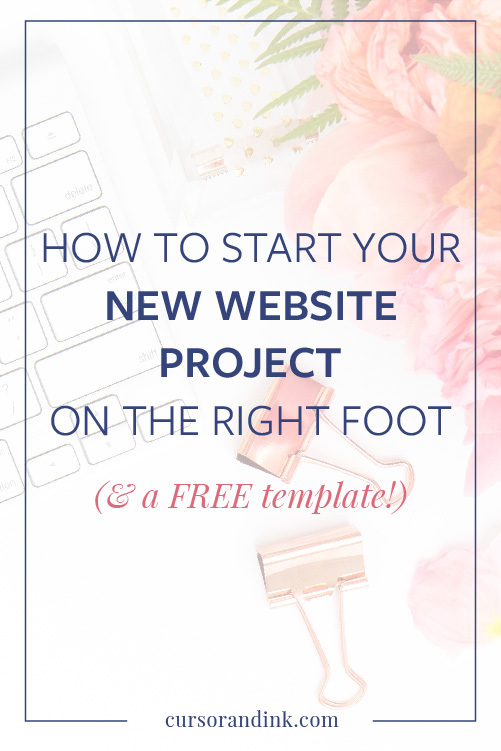 If you want even more resources for planning your new website, take a look at my free email course, Plan Your Redesign. There's a truckload of valuable information in there to help you develop a solid plan for your website redesign -- one that that pays massive dividends for your brand and business. You can get started here.